Tired of relying on dangerous conventional "fixes" to keep severe head pain at bay? If you're like many people who suffer from chronic head pain, you know how debilitating it can be - the pain can be almost unbearable, can't it? And not only that, there are all the other symptoms that come with it, like dizziness, sensitivity to light and sound, nausea, seeing "auras," and many others. Now there's finally a natural solution. MY BRAIN! - the ONE all natural supplement for severe head pain! MY BRAIN! is different because all the ingredients are completely natural - no toxic, synthetic chemicals to put your health at risk. 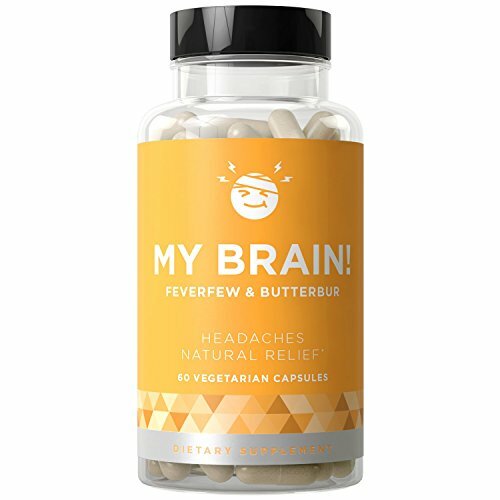 Each vegetarian, easy-to-swallow capsule is packed with a precise blend of feverfew, ginger, butterbur, and magnesium to give you powerful relief fast - backed by several peer-reviewed studies! Plus, we've added Vitamin D, a blend of B vitamins, and Boswellia and chaste tree berry extracts to melt away tension, ease nausea and sensitivity, eliminate dizziness and "auras," and banish other frustrating symptoms! Finally, we've added BioPerine, a black pepper extract that helps your body absorb and use these nutrients for fast relief! We're committed to providing you only the highest quality products! PLUS - Your purchase supports the Vitamin Angels 1-for-1 Program! For every bottle of MY BRAIN! you buy, Vitamin Angels donates a full year of vitamins to a child in need. So you're getting real relief... that you can feel really good about! Try MY BRAIN! for yourself today - your satisfaction is 100% GUARANTEED! DISSOLVES EVEN THE MOST SEVERE HEAD PAIN FAST. Studies have shown that the blend of Ginger, Butterbur, Feverfew, and other ingredients in MY BRAIN! can eliminate head pain quickly... without dangerous side effects! PRECISELY BLENDED TO BANISH PERIPHERAL SYMPTOMS. Severe headaches can come with a host of other symptoms, such as nausea, sensitivity to light and sound, "auras," muscle tension, and many others. We've added a painstakingly selected blend of ingredients to reduce or eliminate these symptoms fast! POWERFUL NATURAL FORMULA. The potent ingredients in each easy-to-swallow capsule of MY BRAIN! are all derived from natural sources - no toxic pesticides, artificial colors or flavors, or wasteful fillers! The capsules are 100% vegetarian, and are produced and packaged in a cGMP certified facility right here in the U.S.A.! BACKED BY OUR UNCONDITIONAL MONEY-BACK GUARANTEE. We know that once you experience the symptom-busting power of MY BRAIN!, you're going to wish you'd found this supplement years ago! But if you're not thrilled for any reason, just let us know within 90 days of purchase, and we'll refund 100% of your purchase price - no questions asked! QUALIFIES FOR OUR VITAMIN ANGELS 1-FOR-1 PROGRAM. When you try MY BRAIN! risk-free today, you're not only getting the pain relief you deserve - you're helping a child in need. For every bottle you purchase, Vitamin Angels is providing a needy child with a full year of vitamins at no cost! If you have any questions about this product by Eu Natural, contact us by completing and submitting the form below. If you are looking for a specif part number, please include it with your message.